I have no outline for this blog. I’d love to be tidy and tell my stories chronologically, but really it’s too hard to remember everything in order. But on this entry I will start from the beginning. Most folks can remember back to four, three years old….maybe even two. Experts say it’s highly unlikely to remember anything before one year of age because that part of our brain is still forming blah blah blah… but please recall we’re shoving conventional wisdom aside for this blog. I’m not sure my first memory is even a memory so much as my first metaphysical experience. I’d no idea how young I actually was until I told my mom about it. She looked at me at little incredulously as I described the room: where my bed was, where the door was in relation to my bed, er… crib. “You weren’t even a year old,” she said, giving me that you’re-freaking-me-out-yet-I-find-this-intriguing look I’ve grown used to. This is where it gets a little profound so please bear with me. You see, I remember lying on my back just having woken from a dream. And I do clearly remember the dream but that’s not important now. What I must convey is that my awareness there in that crib is the exact same awareness I have now. I was not aware of my infancy, nor did I identify as “Jennifer”, but whatever makes me me was as “old” then as the me that’s typing now. I had a place in the universe. I always had. Every once in a while I feel that place between space and time…that place I felt in my crib. But it’s impossible to describe. I lack vocabulary to convey that otherworldly feeling so let me just tell you the last time it happened. A few weeks back I was watching tv with my daughter Sophia and my friend John. I turned to say something to John and my travelling eyes saw the outline of a man sitting next to Sophia on the couch. My eyes made it to John before my brain registered the man. But I recognized him. Peace. The space pulsed with love. My mouth fell. It was the exact same feeling I had in that crib 34 years ago. Our collective and eternal existence. The absence of time. I couldn’t hear the television. All of a sudden the room flooded back. Sophia looked to her right then bolted off the couch. John’s mouth was agape; he felt it too. I called my Dad later that day to tell him about Grandpa. My Dad is a scientist yet never flinches when I share these encounters with him. I knew he’d appreciate hearing how Grandpa was “keeping up with the family.” But he stole my thunder. He confided that Grandpa had ‘visited’ him that morning too. He thought he’d imagined it but my experience substantiated his own. I love that Grandpa allowed me to ‘feel’ where he is. Wherever it is, whatever it is, it’s real. And it’s amazing. I’ll leave you with a picture. 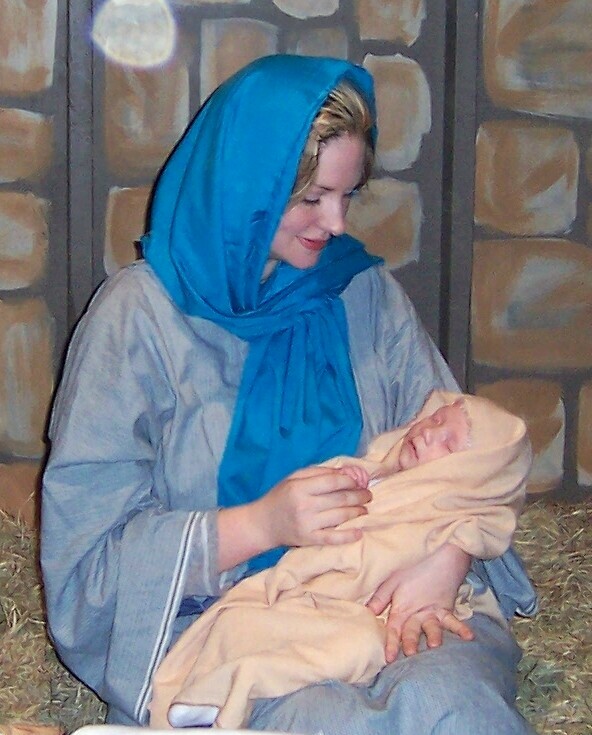 They needed someone with an infant to play Mary at our town’s annual Nativity Scene. 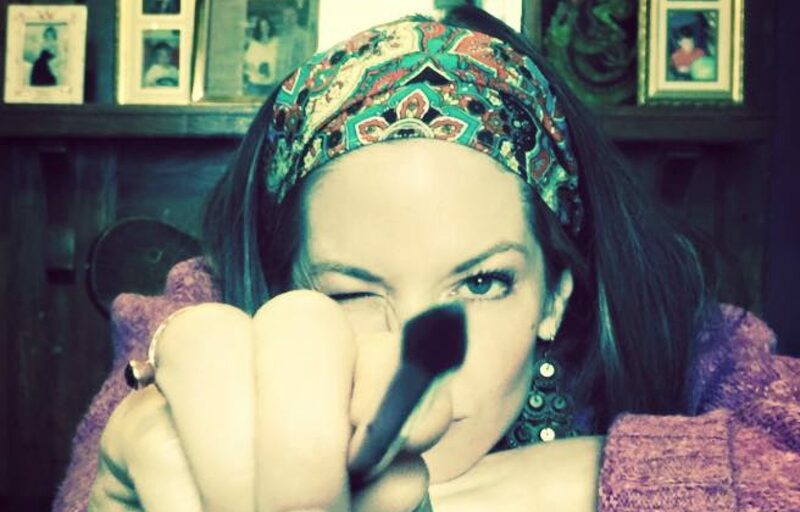 This photo has always intrigued me…not sure what the bright thing is over my shoulder. But I know it ain’t dust. And I can see Christopher’s upper lip under Sophia’s nose! I would love to talk to your Dad now. Sometimes I think about my many deceased relatives and imagine they’re watching me from somewhere. They’re probably mortified. lol Anyway, I was thinking earlier this week that I feel somewhat arrogant to imagine that. I’m sure if they’re still the same peeps, they must have better things to do than check me out. It gives me comfort though to think of them. I’m glad your grandpa is still visiting. I never met either of mine. One day, perhaps……. Well give yourself a break. Spirits almost never look like they do in the movies. Like, never. Oh, you’re a great Mary. I want more pretty please!!!! !